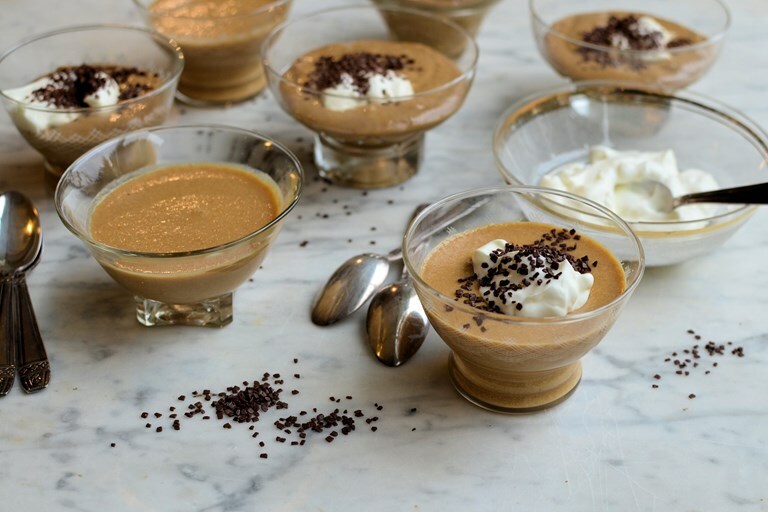 These fantastic little coffee mousse pots from Karen Burns-Booth are simple to make, yet make a luscious dessert – particularly for Christmas when make-ahead desserts come in handy. I am a big fan of coffee desserts – coffee cake, coffee muffins and coffee chocolate truffles are just a few of my favourite treats. When it comes to dinner party desserts, however, you cannot beat a light and fluffy coffee mousse! 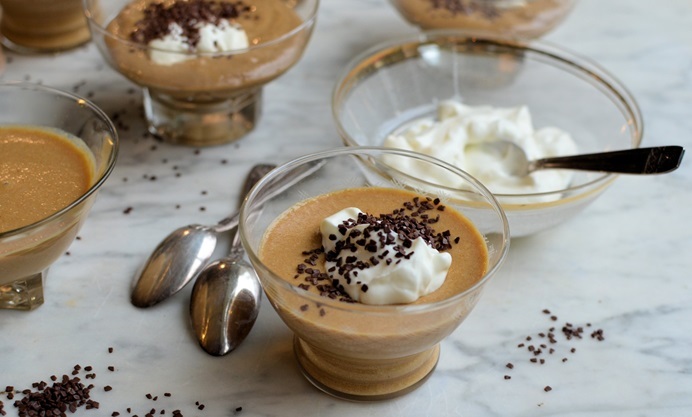 I do love chocolate mousse, but coffee mousse makes such an elegant pudding to end a meal with – and today’s recipe is so simple it’s bound to be a winner! You need to use a high quality instant coffee – along with free-range eggs – to make this spectacular, and if you’re a vegetarian make sure you use veggie-friendly gelatine as gelatine is used to make the mousse set. To finish the little pots off, all you need is a dollop of double cream on each pot and a sprinkling of grated chocolate and you’ll have a dessert worthy of any special dinner party. These wee pots of coffee mousse would also be perfect when made over the festive period, and can be made up to 24 hours in advance, making them a fabulous hassle-free Christmas or New Year treat. Why not add them to the Christmas morning or tea time buffet table too? Or make them as part of a buffet table for a party – you can serve them as French style 'verrines' in small water glasses. Don’t forget to use high quality instant coffee and you’ll be rewarded with a dreamy and luscious concoction of whipped cream, eggs and coffee with chocolate sprinkles!